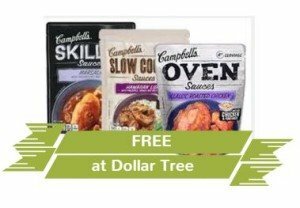 FREE Campbell’s Dinner Sauces at Dollar Tree! Use this $1.00 on any ONE (1) Campbell’s Skillet, Slow Cooker, or Oven Sauce printable coupon to grab FREE Campbell’s Dinner Sauces at Dollar Tree – where they are priced at only $1! The $1.00 on any ONE (1) Campbell’s Skillet, Slow Cooker, or Oven Sauce printable coupon can be printed TWICE.